Heavy snow has fallen across large parts of England disrupting travel and closing schools as forecasters warned of the most severe snow for six years. South-east England was hardest hit, with London buses pulled from service and Gatwick airport closing for a time. The snow also resulted in jack-knifed lorries blocking the M1 and the M25. The Met Office has issued an extreme weather warning for England, Wales and parts of eastern Scotland. More snow is forecast later and on Tuesday. Up to 6in (15cm) of snow was predicted in Kent, London, Surrey and Hampshire as temperatures plummeted overnight. Heathrow Airport has had to shut one of its two runways and says it will take about two hours to reopen. There are "significant" delays and cancellations. London City Airport is currently closed. Gatwick and Stansted airports are open, although fewer aircraft are able to take off. Some 23 flights had to be cancelled and 18 diverted to other airports after Gatwick closed its runway for two hours on Sunday evening. There is no service on the Gatwick Express. A BBC reporter at Gatwick said many people were stranded there with trains services cancelled and taxis out of service due to gridlock on the M25, and that long queues had built up for hotels. Passengers due to fly out during the day are being urged to double-check that their flights are not affected before they begin their journeys. 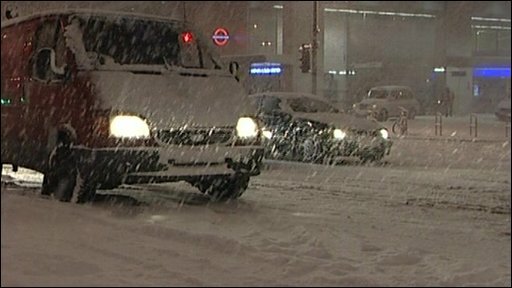 Transport for London said all London buses had been withdrawn from service due "to adverse weather and dangerous driving conditions". Scotland Yard said it had reports of a number of crashes in the early hours, though no-one was seriously hurt. A BBC reporter said he saw many people left confused and distressed after waiting for long periods for buses, only to see them drive past without being in service. There are also problems on some London Underground lines, with the Circle and Hammersmith and City lines suspended. And all services are currently suspended until further notice on Southeastern Trains. 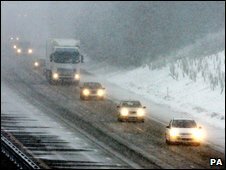 There are warnings of hazardous conditions on the M6 in Greater Manchester, while the M60, M66 and M602 have also been affected by the snow. The M25 is closed clockwise between Reigate and Leatherhead, junctions 8 and 9 and there are reports of several vehicles becoming stuck in the snow. The Met Office is warning of severe weather for much of the country over the coming days, in what is expected to become the heaviest snowfall since January 2003. The London-bound M20 in Kent was temporarily closed between junction nine at the Ashford turn-off and junction eight at the Leeds Castle turn-off because of the treacherous conditions. The Highways Agency said there have been too many minor accidents on the roads "to put a number on". The agency recommended people should only take essential journeys. One motorist, driving in the Midlands, told the BBC conditions were much clearer there, but highway officers told him they had responded to 1,735 incidents over a 24-hour period in the East Midlands alone. The Highways Agency said the organisation was well prepared to deal with snowfall over roads after criticism over its reaction to severe weather in 2003. It added that the number of traffic officer patrols had been increased, there were extra staff to control rooms across the country and gritters had been working through the night. The AA have warned motorists to ensure they keep warm clothes in their vehicles if they were planning to go out, or else risk "flirting with hypothermia".